This isn’t so much a pattern as it is a guideline for knitting a pair of striped socks, in Koigu or any other yarn, that uses up all the yarn. That’s right, all the yarn. If you were to knit the toe, heel, and the cuff in a solid, and the rest of the sock in stripes of solid and variegated, you’d end up with very little or no yarn left over. 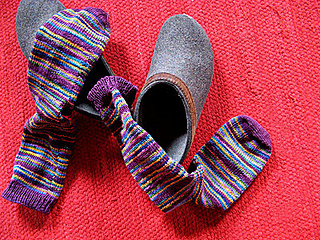 I’ve calculated the ratio of solid to variegated yarn to be used, and what’s let for you to do is knit up the striped socks in your choice of yarn, needles, and style.